Cruising easily, felt good coming back. 11:00am - weights and abs. Legs felt ok. Running fairly hard, but not all out. 6C/43F - spring went away again. 8:00 in the morning but felt ok. 5:04 for recovery run is good. Planned 6k at MP (4:21) but it was quite cold. I can't run fast in the cold and dark (6:00pm). Also had in the back of my mind that tomorrow will be a fairly hard run. Went to my father-in-law's at Tsudanuma and met Cory McGowan for a run in Makuhari. 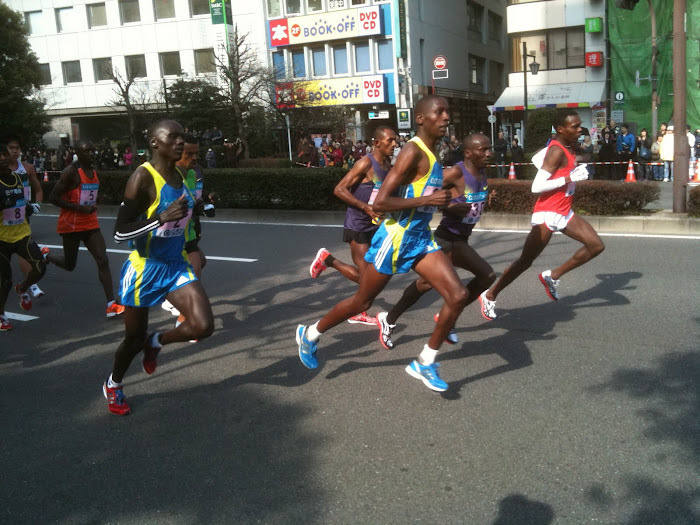 He is a relatively new but pretty good runner who will be running the Tokyo Marathon. We have been emailing for about 6 months and finally met for a run. It was planned as 25k and may have been somewhat less but the 5:07 pace seems right so I am calling it 25k (plus 7.2k there and back to meet him). It was cold with intermittent rain but we had an enjoyable run. Just taking it easy. Legs tired but not sore. Certainly are "piling on the miles." "Tired but not sore" is also a good place to be. Watching Tokyo will be a good motivator for your LA run I reckon. Another solid week Bob. Perhaps your knees and other niggles are getting used to piles of miles? Can't see the marathon not being what you want - baring an unseasonal heatwave or tornado! You are getting a lot of miles in. Is this the usual marathon build up or bigger than normal? Seems like the more miles the better for avoiding the dead leg syndrome at the end of a marathon. I guess I haven't gotten enough miles yet though. Good effort Bob, another good week. You will really fly in LA. AZ: This is more than I have ever run.But wish I had begun it many years ago. You're right; the more miles, the better.